Endorsement: Toby Christensen is so much more then a practitioner, and he is more than a brilliant “teacher”, in sharing his gifts – he introduces you to your own! I took my first workshop with Toby not knowing what to expect. After all, while I have known and appreciated him as a very talented drummer, I had no idea of his depth and clarity within Spiritual realms. What a joy to experience his insights, patience and practical application to the world of Spirit! I learned so much during this first class – techniques I use to this day -, that I look forward to and take his workshops every time he comes to town. I know I’m a bit late to the party, but I just read your Newsletter – so pure and honest and inspiring, I just wanted to let you know what a great job I think you’re doing living the teachings, being a role model, not up on a pedestal, but truly being with people in the struggle and in the ascent. I find it rare the people that can do both without littering the place with their crap. Ok, that sounded bad, but you know what I mean… and you have struck the balance, My Friend. I bow to your mastery. Hope I get to see more of you in 2009.
okay, that was very, very WOW! 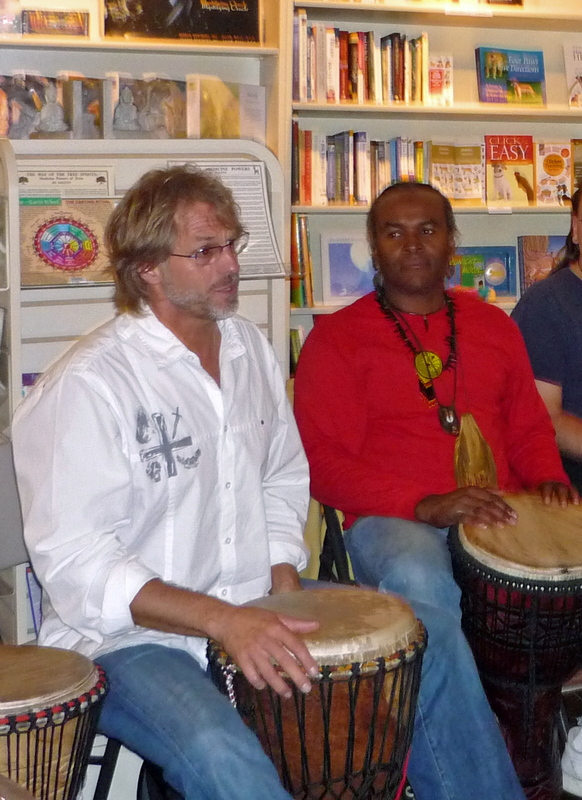 It is great to hear from so many people being touched deeply by the HealingDrum. As Toby brings his gift to the world in a bigger way we know that he is held in the blessings of those who have been touched by his work. I know he is grateful for these kind words and we at HealingDrummer and TobyChristensen.comare too! Thank you Toby for joining with my yoga students and me last week. This was the first time I have had this experience where “another force” was there to influence a yoga class I teach. And it was powerful on many levels. But in general, the students were able to connect to ancestry in a way some of them never had. And, their breathing was much easier with Toby’s masterful drumming. As Toby worked over each student during Savasana, I sat and experienced what was in simplistic terms, a movement and opening of the chakras. Amazing energy shifts! I am blessed to know you Toby and hope we can bring this to people in this yoga setting again.